A major winter storm blasted a large area of the eastern U.S. on Monday and Tuesday. Heavy snow and high winds impacted states from the Mid-Atlantic to New England. Starting out as a weak area of low pressure, this storm quickly intensified when it interacted with the jet stream and transformed into a massive nor’easter. It tracked further east than expected and that change in distance to the coast made a big difference in where the heaviest snow fell. On Long Island, only a few miles east of NYC, communities dealt with blizzard conditions and over 20 inches of snow. While not one for the record books in the Big Apple, this storm ended the so-called snow drought in the northeast and brought enough snow for a fun day of sledding in parks across the city. A blizzard warning is currently in effect for New York City. The storm is expected to be our biggest snowmaker of the season to date. It could also possibly be one for the record books. 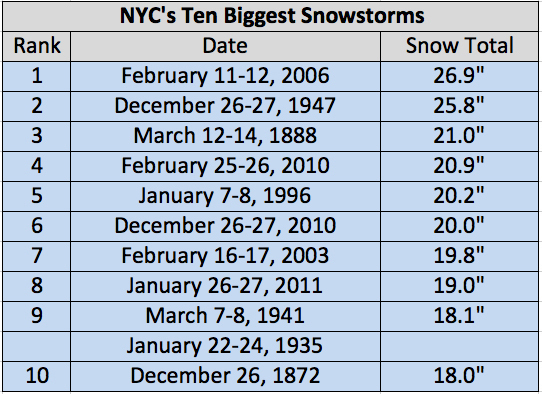 Here is a look at the top ten snowstorms in New York City history. All measurements are from Central Park in NYC. Source: NWS. A blizzard is expected to blast the northeastern United States over the next two days. Different than a typical winter storm, a blizzard is characterized more by its winds than the amount of snow it produces. Considerable falling and/or blowing snow that frequently reduces visibility to ¼ mile or less. These conditions heighten the risk for power outages and often produce whiteout conditions on roadways, making travel extremely dangerous. Its official! 2014 was the warmest year ever recorded on planet Earth. According to a report released today by NOAA’s National Climatic Data Center, Earth’s combined average temperature for the year – over both land and sea surfaces – was 58.33°F. That is 1.33°F above the 20th century average. It surpassed the previous annual record held by both 2005 and 2010 by 0.07°F. 2014 also marked the 38th consecutive year that our global temperature was above its long-term norm. Rising ocean temperatures, according to NOAA, helped fuel this record warmth. The globally averaged sea surface temperature for 2014 was 1.03°F above the 20th century average of 60.9°F. That is the highest on record, breaking the former record set in 1998 and tied in 2003 by 0.09°F. It is interesting to note that ENSO-neutral conditions were present during all of 2014. That means El Niño, the warm phase of ENSO (El Niño-Southern Oscillation) did not influence this record warm year. Scientists, while acknowledging the decrease in the rate of warming over the past decade, say this fact undeniably confirms the continuation of global warming. While heat dominated most of the planet in 2014, including parts of Alaska and the western United States, the eastern two-thirds of this country was one of the few cold pockets. Overall, the contiguous US experienced its 34th warmest year on record. This highlights the fact that climate change is a complex global phenomenon that involves much more than what is happening in our own backyards. 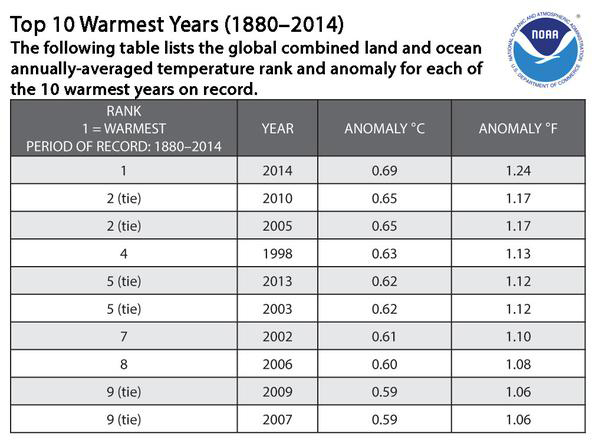 With records going back to 1880, nine of this planet’s top ten warmest years on record have all occurred since 2000. The only exception was 1998. As greenhouse gases – which drive our global temperature upward – are continuously emitted into the atmosphere, scientists say we can expect global temperatures to continue to rise and more warm records to be broken. Like most of the US, including here in NYC, temperatures across the globe soared last month. In fact, December 2014 was Earth’s warmest December on record. 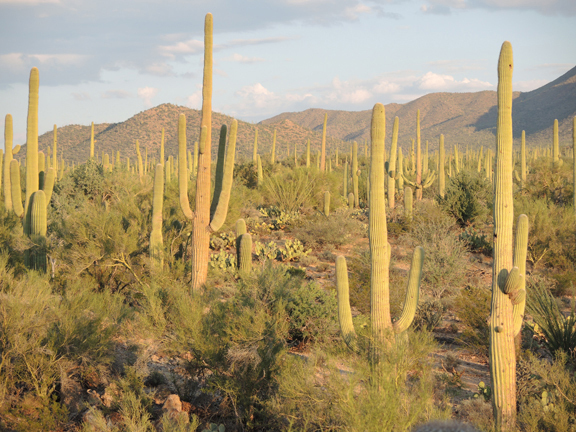 According to the latest report from NOAA’s National Climatic Data Center, the planet’s combined average temperature for the month – over both land and sea surfaces – was 55.39°F. That is 1.39°F above the 20th century average. December 2014 also marked the 6th month this year to break a global temperature record. The calendar year of 2014 (January – December), is now ranked as the warmest year on record for planet Earth. Global temperature records date back to 1880. The “Dead of Winter” is an old saying that refers to the coldest part of the winter season. This annual chilly period, statistically, begins today. While actual daily weather varies, historical average temperatures in most of North America reach their lowest point of the year between January 10th and February 10th. This cold period does not begin on the winter solstice, the day we receive the least amount of solar energy, because of a phenomenon known as seasonal temperature lag. Air temperature depends on both the amount of heat received from the sun and the amount of heat lost or absorbed by the oceans and continents. From the start of winter through mid-February, both the oceans and land are losing more heat than they gain.